Glyphosate is frequently applied to corn and soybeans growing areas like these in Iowa. Photo Credit: William A. Battaglin, USGS. U.S. Geological Survey (USGS) scientists report that glyphosate, known commercially by many trade names, and its degradation product AMPA (aminomethylphosphonic acid) are transported off-site from agricultural and urban sources and occur widely in the environment. This study is the largest and most comprehensive assessment of the environmental occurrence of glyphosate and AMPA in the United States conducted to date, summarizing the results of 3,732 environmental samples collected between 2001 and 2010 from 38 states. Glyphosate is popular due to its ease of use on soybean, cotton and corn crops that are genetically modified to be glyphosate tolerant. It also facilitates no-till farming practices, and has a variety of uses in urban areas. Glyphosate use in the United States increased from less than 5,000 to more than 80,000 metric tons per year between 1987 and 2007, but glyphosate is seldom included in environmental monitoring programs, due in part to technical difficulties in measuring it at concentrations relevant to environmental studies (less than 1 microgram per liter [μg/L]). Glyphosate by itself is no more than slightly toxic to birds, fish, and aquatic invertebrates; and exhibits relatively low oral and dermal acute toxicity to humans. Recent studies, however, have documented the potential for other health effects. Many studies indicate that commercial glyphosate formulations can be more toxic than pure glyphosate due to the toxicity and/or action of additives, such as surfactants (detergents). 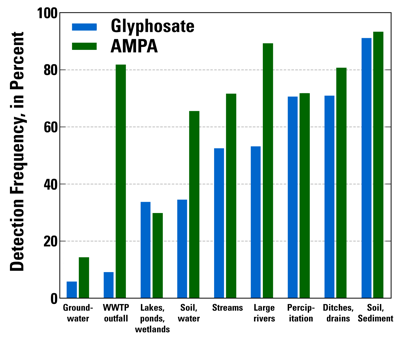 Detection frequencies for glyphosate and AMPA by hydrologic setting. Most observed concentrations of glyphosate were well below existing health benchmarks and levels of concern for humans or wildlife, and none exceeded the U.S. Environmental Protection Agency's Maximum Contaminant Level or the Canadian short-term or long-term freshwater aquatic life standards. 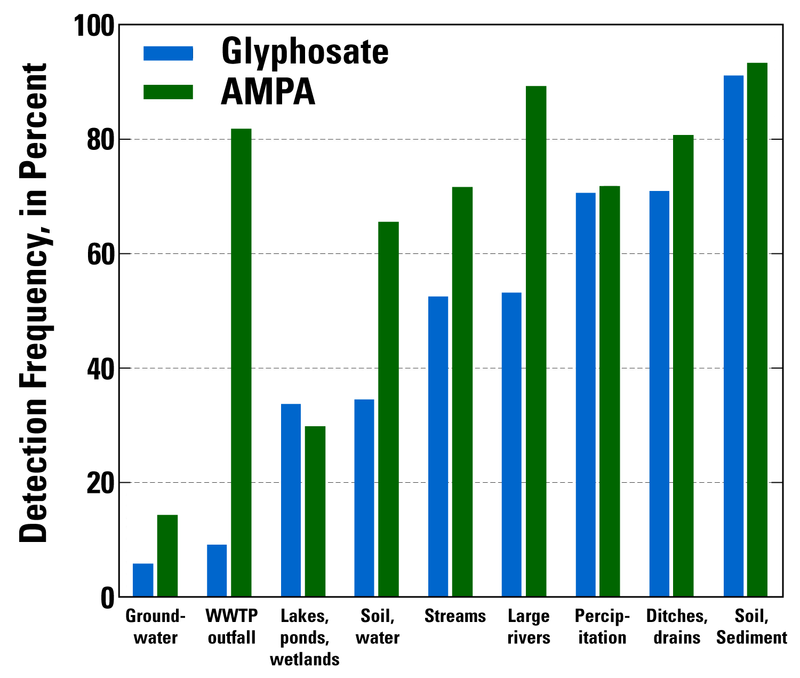 However, the results indicate that glyphosate and AMPA frequently add to the chronic low-level exposures to mixtures of pesticides and pesticide degradation products that plants and animals experience in a wide range of ecosystems in the United States. This study was funded by the USGS Toxic Substances Hydrology Program, with support from the Amphibian Research and Monitoring Initiative, and the National Water-Quality Assessment Program. This paper is part of a featured collection of 13 articles, published in the Journal of the American Water Resources Association, that are focused on contaminants of emerging concern. Battaglin, W.A., Meyer, M.T., Kuivila, K.M., and Dietze, J.E., 2014, Glyphosate and its degradation product AMPA occur frequently and widely in U.S. soils, surface water, groundwater, and precipitation: Journal of the American Water Resources Association, v. 50, no. 2, p. 275-290, doi:10.1111/jawr.12159.